Do Persian cats suffer from health problems? Well, yes and no. You can read about them here. 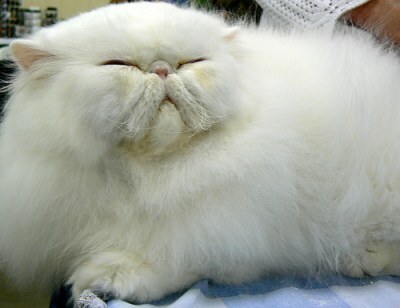 But don’t make the presumption that Persian cats are all automatically unhealthy – they are not. It really depends in my opinion on the breeders (if you buy from a breeder) and how they deal with the health issues raised here. And also we should remember that the Himalayan cat breed is simply a pointed Persian, and the Exotic Shorthair is a shorthaired Persian, so what is said here applies to these cat breeds too. The difference between Ultra Persians and Traditional Persians is the effect breeding has had on their facial appearance and underlying bone structure. They have a “brachycephalic” skull – short and round with a flat face. See: cat head shape for the range of shapes of different breeds. See also a discussion on the change from trad to extreme. So, in answer to the question as to whether the Traditional is more healthy than the Ultra, the answer is “yes” (that doesn’t mean all Traditional Persians are more healthy). As mentioned, this is because of the health issues associated with the “Pekingese” look of the contemporary Persian cat (as the CFA described it in 1969 – the dog equivalent is the Pekingese). These issues are breathing and sinus problems and, as described on this page, tear duct overflow. Other health problems caused by this unnatural head and face are “abnormal alignment of the teeth, and impaired respiration….compaction of the teeth….overshot lower jaw”1. Although not really a Persian cat health problem, the very thick, dense and long coat requires “a great deal of daily care..”1. If not health problems could ensue. This last point could apply to traditional and extreme cats. In addition brachycephalic cats such as the Persian and Himalayan are prone to respiratory infections because they have less area for the protective muccociliary blanket. This is a mucous membrane which lines the nasal cavity tapping bacteria and foreign bodies. It is the first line of defence against infection. Update Sept. 2010: Richard lives with a 3 month old ultra Persian and refers to his problems with Persian cat health problems: My Little Magpie. Important: please go to the base of this page to see the sources of this information, which discusses potential Persian cat health problems. I only use quality, authoritative and informative sources. Update March 2011: Persian cats have a predisposition to cancerous eye tumors and basal cell carcinomas that are malignant – see Cat Skin Cancer. Persian cat health problems can take the following form, nostril constriction, cherry eye, tear duct overflow, dental malocclusions, polycystic kidney disease, entropion, and seborrhea oleosa. An inherited disease exists within the Persian cat breed. The disease is called Progressive retinal atrophy (PRA). It causes blindness. It affects other mammals including humans. It is early onset in Persians. Read about Bengal cats and PRA. Below, I focus on two health issues, polycystic kidney disease and tear duct overflow as common Persian cat health problems. PKD1 has gone unnoticed for many years and has spread throughout the Persian breed. It is estimated that over 37% of Persians have PKD1, a breed that accounts for nearly 80% of the cat fancy. PKD is most easily diagnosed by ultrasound, which can identify the disease very early in its course. When carried out by experienced personnel using proper equipment, ultrasound diagnosis is 98% accurate after approximately 10 months of age. Greatly reduce this frequency by using ultrasound screening (and now DNA screening) methods and improved breeding practices (see below). Which cats should be tested? What can owners and breeders do? Testing for Persian PKD1 can be performed as early as 2 weeks of age. Cat owners will be able to collect their own samples, without a veterinarian. Wait 60 minutes if the cat has been eating, drinking or nursing before sampling. The swabs are stable at room temperature indefinitely. They can be shipped to any laboratory offering the test worldwide. Regular post can be used. Experts conclude that Breeders need to work with scientist to reduce the occurrence of this disease through a breeding programme. I am sure this is happening as this is clearly one of the exotic Persian cat health problems. Kidney Care Kit with Drinkwell Pet Fountain and NHV Tripsy: Drinkwell Pet Fountain provides the hydration your cat needs while Tripsy helps control infections, reduce irritation caused by cat kidney stones and acts as a diuretic. Tear duct overflow can occur in any breed of cat. However, because of the very flat nature of the face of the exotic Persian cat, additional causes for the failure of tears to drain away are presented. Here is a quick read overview of one of the potential Persian cat health problems. The abnormal overflow of tears due to overproduction of tears or poor drainage of tears. The tears overflow onto the face. wicking of tears onto hairs present in the crease where the eyelids meet. Chediak-Higashi syndrome (oculocutaneous albinism). Dr Clark says that this is a “well-recognized” problem with Persian cats. It is an automsomal recessive trait. It caused lighter than normal hair color. The symptoms in addition to the one mentioned are: photophobia, a tendency to bleed and perhaps a heightened susceptibility to infection. Treatment is symptomatic. Congenital ankyloblepharon (in Blue Persians). This condition results in the joining of the upper and lower eyelids by a membrane. Entropion. This is the inversion of the eyelid margin. The eyelashes rub and irritate the cornea of the eye. This leads to excessive tearing, squinting, corneal vascularization and ulceration. Treatment: surgery. Congenital epiphora. This is the medical term for tear duct overflow referred to above. Primary glaucoma. This is a elevation in the pressure in the eye whereby the eye becomes unhealthy. It is caused because the rate of production of aqueous humor (the liquid in the eye) is higher than the drainage of the liquid from the eye. The eyes can bulge. Skin fold dermatitis. Concerns the facial folds of the face. Wetting of the face due to tear duct overflow contributes to the problem. The area should be kept clean and dry. This is another of the Persian cat health problems. Mannosidosis. This medical condition concerns a component of cell membrane and body fluids. Some cats are stillborn. Some have ataxia and central neuropathy, slow righting and flexor reflexes, intention tremor and strabismus from 3-7 months of age. Growth is retarded. Urinary tract stones. Persian cats suffer a higher than average occurrence of urinary calculi (small stones in the urinary system -the bladder). If small the stones are often passed in the urine. If large they may have to be removed surgically. The problem is worse for males. A plug can form. Medical treatment will be urgently required if the urinary tract is blocked. Low magnesium cat food (new window) is part of the treatment. Cats suffering from urinary calculi are very often overweight (80%). Seborrhea oleosa. A chronic skin disease causing scaly and greasy hair. Yellowish clumps stick to the hair. The coat smells rancid. It can be caused by providing homemade cat food that is poorly supplemented. True idiopathic seborrhea. A chronic disease that can be controlled. The skin becomes scaly and crusty. Regular medical shampooing helps control the condition. Shampooing with coal tars and salicylic acid must be avoided. Supplementing a cat’s diet with fatty acids, linoleic and arachidonic acids will help. Studtail. Frequently occurring in sexually active males this is a seborheic skin disorder on the tail. It is thought to be caused by hyperactivity of modified glands of the tail. Polycystic renal disease. This is mentioned above. Perinephric pseudocysyts. This is an accumulation of fluid around the kidneys. Treatment is drainage of the cyst. Neonatal erythrolysis. This is the destruction of red blood cells in newborn kittens. It occurs when a queen has blood type B and the kittens have the more common blood type A. It is one of the Persian cat health problems. Patellar luxation. This disease can be found in conjunction with hip dysplasia. The knee cap slides about to the sides. It can cause lameness and a reluctance to jump. Hip dysplasia. The hip joint pops out of the socket. Causes intermittent walking abnormalities, lameness and a reluctance to jump. Information about Persian cat health problems has been carefully researched from the following sources. Free Animal Health Resources Web Sites. 1. The Cat, Its Behavior, Nutrition and Health by Linda P Case page 25 pubished by Blackwell Pubishing ISBN 978-0-8138-0331-9 — Note: Linda says that cat associations have rejected the perpetuation of the extreme Persian. As far as I can see this is not an accurate assessment. This entry was posted in Cat Breeds, Persian cat and tagged cat health, flat faced persian cat, Persian cat, Persian cat health problems by Michael Broad. Bookmark the permalink. No Persians don’t cause disease any more than any other cat. I have inherited a white persian named Capone. He is a flame point they say at the vet’s office, my son said he is peach tipped. I just found out that my cat Pony, has mega colon and will need medicine for the rest of his life. I wondered if this mega colon is amoung any health problems with persians? I love my cat and worry about his condition. Debora, Thanks for visiting and asking. Megacolon is not associated with the Persian cat to the best of my knowledge. I have never read about that in any reference work. However, the Persian cat is prone to have more than the usual inherited diseases. The person cat together with the Siamese cat are at the top of the league of purebred cats that inherit the most diseases. Your Persian cat is probably fine. This page lists all the diseases this cat might have. Thanks for visiting and commenting. Hi, I’m taking my smokey Persian cat to the vet soon but would like to have some idea of what we may be dealing with first. Belle is about 3 to 5 years old, female, and generally a small cat. She spends a lot of time in the kitty litter tray without actually doing anything. She has also taken to peeing elsewhere, usually on soft furnishings such as beds or couches. She seems to be an otherwise healthy cat. Are there any urinary type diseases specific to her breed that we should be aware of ? Hi Dave, this sounds like cystitis, which can be brought on by stress and Persians are prone to anxiousness and litter box problems (inappropriate elimination). Thats my guess. Good luck to you both and thanks for commenting. Cat food can also help bring on cystitis. More water, fish with added water, no dry food and a make sure you are around a lot. Separation anxiety can produce stress. Hi Ruth, I hope someone responds. In the meantime I’ll do a bit of research to see if I can provide some links for you. It is quite technical. I have skim read it. My distinct impression is that the surgery is OK but not great. There is some chance of disaster as shown on the page and if you decide to proceed, it will be essential that you select a first class surgeon with a good track record that is verifiable. Please don’t take risks. This is tricky surgery it seems to me and failure can make things considerably worse. Micheal, I did have time to read through your article and I plan to go through your sources and to verify if the information is accurate. I do agree on some of your statements. The statements about the pkd have a lot of validity. As a Persian breeder going through those issues at the time, other breeders where having ultrasounds done on their cats. A couple issues that I had with the ultrasounds was that the ultrasound is basically a picture taken of the kidney at that point in time. There were too many unknowns at the time. I talked to my vet and almost every answer to my questions regarding the disease was “I don’t know”. I became a member of many vet newsletters for more information including the Cornell Univ. newsletter and I read every article about many of the breeds. Each ultrasound cost about $300 for each cat. If you had about 15 cats at the time and you already spent mounds of money to run a cattery in the first place, how many ultrasounds could you afford to pay for? There was no proof that doing ultrasounds on a cat would get accurate results because there was nothing to measure it to. At the time there were no guarantees that the results the technician gave you were accurate. You don’t know if your technician was experienced or not etc. Most of the breeders that I knew either, paid a fortune for the ultrasounds and closed down breeding or altered their cats and found pet homes or euthanized them. Where was the scientific basis that ultrasound is accurate? I also bred Selkirk Rex which was known for possibly having B blood type from inheriting it from the British Shorthair. I was informed at that time when I started breeding the Selkirks Rex cat, that all Persians group cats (including Himalayans and Exotics) had blood type A and if you bred your Selkirk Rex had blood type B from the Brits you could get a litter with what we called fading kitten syndrome. The cause was unknown at first (thus the name) was latter to be from a queen with type B blood nursing type A kittens. The milk poisons the kittens and those kittens will die of FKS. Now none of my information is based on researched facts as you have taken time to do. All my statements are based on my own experiences. So if we purchased a Selkirk Rex or a British SH, we had it tested first or the breeder had already tested the cats blood type. I did not buy any cats with blood type B and as a result I had no FKS in my cattery. When I started breeding cats again in 2012 I tested my Napoleons for pkd with the new method of a DNA test through UC Davis. A cat that was tested resulted in one gene positive for pkd. He has been neutered and found a pet home. So what does that mean? Out of 2 genes (one from each parent) 1 is positive. Does that mean he will get pkd or he won’t? After reading the information at the UC Davis website, the answer is: you guessed it: “I don’t know”. All of my other cats have been purchased from breeders who have tested the parents of the kittens negative for pkd and they have been tested negative themselves as breeding cat. The DNA test are a much better method for pkd reduction among the breeding cats but each test cost $40.00. This is a small price to pay for healthy cats and yet it is another cost that the breeder must pay for as a cattery cost that was already not making any money. Dr Lyons is a wonderful, knowledgeable person so any statement coming from her as long as it is accurate is correct but there are many breeds of cats prone to many cat deceases. No single breed should be singled out in anyway that indicates that a particular breed is prone to one of these deceases because this gives the impression that breed as a whole is unhealthy. All males used for studding or breeding get stud tail. This is not a breed specific trait. All breeds can also get many of the cat deceases. Napoleons as a breed are not known for any breed specific deceases. You made some good statements indicating that the traditional breeds are much healthier than the newer extreme breeds which I agree with. Napoleons are produced out of traditional Persians but there is a disagreement among the Nap breeders referring to how often they should be using extremely flat faced Persians. As a change breeder, I say stay away from the extreme faces but there are many Nap breeders who disagree with me and say that they will watch themselves to prevent the Naps from getting flat faced. Who were watching the Persian breeders when they decided to go for the flat face? When I hear the Nap breeders arguing with me on the subject, I can only imagine a repeated history of the same mistake. Those other breeders don’t want to allow the domestics to breed allowed to be bred to the Naps for many reasons one in particular is to avoid the longer face as they prefer the rounder heads, faces and eyes. Allowing the domestic to be an outcross for the Nap will bring in hybrid vigor (healthy lines/less inbreeding problems) and will solve some registration/pedigree problems. The opposing breeders only want to allow the Persian group to be used in the Nap programs. The Persian group breed is already a breed with to much inbreeding even with the Himalayan and Exotic breeds behind them such as the Siamese and American shorthair etc. Again my statements are my opinions and from my experience and not from research so I cannot guarantee how accurate my statements may be. If you have more questions on these subjects, you are welcome to go to my website and email me with questions. My website is purwaky.net and my email is purwaky1985@att.net. There is also an email through my website but please make allowances for temporary construction. In that order. I have page on that. These are two of the “original” cat breeds. They are the most long standing. The modern Persian has no connection with the original from the Near East. I think you will find that the very high level of PKD in the Persian is well recognised. For me it looks like a catastrophe of a breed yet the CFA proudly declares it is the most popular breed in the USA and the world. I find the whole situation very odd. When I visited a cat show in Oklahoma about 3 years ago there was a person there with a mobile ultrasound device. I made a short video of a Persian being tested. I guess his presence is evidence of a Persian PKD problem but it was not only for PKD or Persians. I agree we should not single out the Persian as some sort of monster but from an outsider’s point of view it does not look good for this breed. Incidentally, Dr Lyons made a mess of analysing DNA data to ascertain the origins of the Turkish Angora and the American breeders have hijacked this breed. Not good either. >Out of 2 genes (one from each parent) 1 is positive. Does that mean he will get pkd or he won’t? After reading the information at the UC Davis website, the answer is: you guessed it: “I don’t know”. Your cat has PKD. The mode of inheritance for PKD(autosomal dominant) has been known for a long time. Did the UC Davis website not have this info, or are you unaware of how dominant/recessive genes work? Well, if one parent has PKD and the other not, then half the kittens will get it if the gene is dominant. That is a fairly crude statement and probably of no help but it is true. I hope it does answer your question. The picture is not my cat. My cat does not have PKD and he is not a Persian. I am sorry for all these kitties health issues and I would like to offer a few suggestions. My history is that I was a cat breeder/exhibitor from 1985 to about 2005 or Persians (and Himalayans), Exotics, and Selkirk Rex. As a former Persian breeder, I must agree that the Persians can have some health problems. The main problems come from the extremely flat faces, and years of breeding for this type of quality. My cats did come down with some serious issues like corneal sequestration, continuous UTIs, and serous tearing problems. I quit breeding and closed my cattery in 2006. I loved the cats and cat breeding and showing although I was not a competitive person. Some issues that I have seen with the breed is (1) breeders tend to follow what is the most popular and if the cat associations agree with and change the show standard to look for an extremely flat face then the breeders will follow that trend. There is a group of breeders that make the decisions to change the breed standard that is desired for a breed. And most Persian breeders do realize that as a breed that the Persians have problems with the flat faces but they are so caught up in this trend that they feel that they must overlook this to keep up with the other Persian breeders and the politics involved. Thirdly a cattery who houses many cats tend to have cats that will pass uti’s and other illnesses back and forth to the other cats. I spent a lot of time dolling out antibiotics, eye ointments and other medications on a regular basis per my vets instructions. Vet are very expensive as well as maintaining a cattery is very expensive therefore cat breeders do not make a profit on selling cats. Actually this is an expensive hobby that keeps the catteries funds in the red and the hobby uses up much more money than you can imagine. Breeders breed cats for the love of the cats and for the fun of showing them. On the issue of howling cats, whether they are Persians or not. Any cat that has not been altered (spayed or neutered) are acting normally when they howl for another cat and try to breed them. These are cats that have raging hormones telling them to breed. If you don’t intend to be a breeder then you should get your cat altered. Both males and females will spray urine in your house, they will try to get outside, they will call loudly for three weeks strait all night as loud as they can. Overpopulation is a serious problem and animals are being euthenized everyday because people don’t know that they should alter their pets. If you actually want them to be your pets and to be affectionate to you then you should alter them. It will not be cruel, it will be a gesture of kindness instead. The unaltered pet would rather breed than look to you for love. They will try to get outside to breed and spraying in your house if a normal function that the cat does not see as wrong. An altered cat will want affection from you, will not normally spray or call loudly in the night. They will not get outside and either get hit by a car, get pregnant, or catch feline leukemia, poisoned, etc. An altered pet will instead act like a beloved pet and they are less likely to get many cancers if they are altered. Please do your research on the internet and be a well informed animal owner. The majority of problems that you describe are a normal cat behavior problem that has nothing to do with which breed of cat they are. Persians have a lot of health problems buy this may not be the breeders fault, this if a problem of the breed itself just like was mentioned of the Siamese. There are traditional breeds of these cats available for sale to the public as pets. There is a website that promotes the traditional cat breeds like the Persians with baby doll faces (not flat faced) and Siamese with apple heads (rounder heads) which are the old fashioned types of the breeds. There are many breeders who breed and sell traditional breeds like the type of cat that I call the baby doll Persian with the Napoleon. Napoleons do not have the health problems like the Persians even though they are produced from they hybridization of the Persian to the Munchkin. The Naps have a baby doll face which have short legs (dwarf legs) from the Munchkins. Napoleon litters can have both standard short legs and non-standard long legs kittens in the same litter if you don’t like the short legs. There was a heart problem mentioned in one of the responses. Most breeders (if they are reputable) have a health guarantee just for genetics and heart problems. If your new kitten is diagnosed with any congenital or genetics problems you can normally contact the breeder and get this resolved per the kitten contract that should have come with the cat. There are good people and bad people in every area of life and unfortunately there are bad breeder too. You should always do a background check, ask many questions to the breeder, or ask other breeders about a breeder before you buy a kitten from them. It can be difficult to get these answers about a breeder but this is just like buying a car or any other large purchase look around for the best deal. Cats or dogs both may foam at the mouth and have seizures from flea products. Some may have a mild reactions while other may have more serious problems. The flea products have a nerve agent in the product which I have seen some animals have a mild foaming reaction and or seizures right after the product is applied. There was a recall many years ago where the Hartz Mountain flea products killed several small dogs and cats of all sizes because they made the mistake of adding too much of this nerve agent to their product. The company was sued and many owners lost their beloved pets due to the companies mistake. I felt so sorry for those owners who lost their pets as I was of course a cat breeder and lover at the time but I also bred Yorkshire Terriers too. If you have any more questions about cats, dogs, the breeds I have mentioned or other animal questions you can email me at purwaky1985@att.net and I will try to answer any questions that I can to the best of my ability or I will try to find the answer for you. You can also reach me through my website which is purwaky.net Micheal I have not read your article but I have read all of these replies to it. I promise I will read it as soon as I get the time to do so. I just wanted to make sure that your readers were informed and had some of their questions answered immediately. I have read many of your articles and I do find them very interesting. Airflow is not the problem, at least not with my kitty. The specialist I took her to (who is the best in the field in my State) said turbinates are similar to nose hairs in humans. Since my kitty’s turbinates have atrophied, she has constant inflammation and infections because stuff that would normally get filtered by the turbinates passes through to where it doesn’t belong. She’ll have to take steroids for the rest of her life, as well as antibiotics when it gets to the infection stage. She’s a very small kitty (a little more then 6 pounds). The specialist says cats don’t eat when they can’t smell their food. My kitty spends a lot of time at the vet because it’s one problem after another. I’d like to kill the breeder who sold her to me. She (the breeder) apparently is more interested in making money than she is in the health of her kitties. The money is a problem (I’ve spent thousands on my kitty since I got her), but the biggest problem is that I love her so much and it breaks my heart that she’s suffering. Thank you for the added information. I really feel sorry for both of you. Your story is the reality behind the veneer of the most popular cat breed according to the Cat Fanciers’ Association. We all know that the contemporary Persian has health problems because of the flat face but we don’t know how prevalent it is and how widespread. Your informative comments provide us with a clue. I can appreciate how you feel. It is a constant worry. When my lady cat was dying over a period of 9 months it was very stressful. Your cat is not dying but she is ill so there will be similar emotions. To be on steroids permanently is a last resort, isn’t it? You get side effects and the same with antibiotics. Michael, thank you so much for your very kind concern. My male kitty (bought from a different breeder) recently developed UTIs that he can’t seem to get rid of. He gets them over and over and over, and none of the tests the vet has done can explain why. He’s now on medication that shouldn’t be taken for more than 3 days, but the UTI comes back as soon as he stops taking the meds. So I have 2 sick kitties, a 2 year old girl and a 3 year old boy. Neither one of them will live a long life, but they will be spoiled rotten and taken care of until they cross the rainbow bridge. As much as I love Persians, I will be getting shelter cats from now on. As we all know, losing a beloved fur baby is so hard to deal with. You might want to add nasal turbinate atrophy to your list. I bought my girl kitty (at age 11 months) from what I later found out wasn’t a reputable breeder. My vet says there’s NO way the breeder didn’t know my kitty was sick when she sold her to me. She’s the sweetest little kitty and it breaks my heart to know she was born with a serious congenital deformity, and that she’s probably never felt well a day in her life. Thank you for sharing your experience. I’ll look into that condition. Update: It took me a little while to find the information but turbinates are spongy structures inside the nose that are tear shaped and which control airflow. “Atrophy” means to waste away. I will presume therefore that airflow is not as good as it should be without turbinates. This affects breathing. We know that modern Persians have relatively poor breathing. So the moth aint a problem? Moths shouldn’t be poisonous to cats. A cat might react badly to eating a moth but it shouldn’t cause symptoms that indicate the cat is poisoned. Thank u :). Shez ok now cuz of u. But shes just a kitten about 4 months old. How can she have seizures. Btw she ate a moth. Hi Hamza, Two things. (a) A kitten can have seizures (b) I am guessing at what might be the problem (poisoning perhaps). As mentioned the vet is the best person to diagnose your cat’s health. Is she alright today? A moth should not be a problem as you infer. Yeah, shez alright, i took her to the vet, the doctor gave some syrups for her. Btw, thank u very much michael. Take care Hamza. The moth may have produced a short term reaction – a foul taste – which caused slight frothing at the mouth but no more. I am pleased your cat is OK.
Hi Hamza, Sorry to hear about your cat. I am afraid you can’t diagnosis a health problem like this when the symptom is a fit (a seizure or some wort). Seizures are a symptom of many diseases and often at quite a serious stage in the disease. The diseases that are associated with the Persian do not produce this symptom but there are many others that could affect a Persian cat as for all cats. However, it may be something she has eaten, which has poisoned her. There is no doubt in my mind that you need to get her to the vet asap for tests. I know that means spending money but there is nothing else you can do if you really care about your cat and I believe you do care. Check her food. What is she eating? Does she go out? What sort of stuff in your home can she eat? Have you sprayed her with something? Wow, you certainly are an expert researcher. I must come back and read it all when I’m not so weary. I just wanted to point out that ANY cat breed that gets as popular as the Persian will attract money-bibbers. People who do not love the creatures they raise and sale, so they end up with illnesses. In my opinion, this could have a lot to do with the Persian sickness issues. Sure there are certain genetic issues that sit there in each of these cats. If at me. The right part of my 7th chromosome faces the wrong way, thus I have a chance to have Cystic Fibrosis. All my siblings have that equal chance. Only my sister got the illness. 1 our of 5. My male persian cat, Romeo, has been with us since more than a year. He’s been quiet and friendly until last month when our tenants bought a female cat who started coming to our home regularly. Now, when she’s not around, he becomes very loud and screams on top of his voice. Its very strange and disturbing for us since we never heard him so loud, and also becuase persian cats are known to be quiet. Please suggest what shall I do to control his sreaming. In other words your cat is fine when the female cat is around (her presence does not bother him) but when she is not there he calls for her it seems to me. The indication is that he wants her around. Is he neutered by the way? Is she spayed? I’d like you to answer those two questions first in a further comment if you have time. We can explore the problem further. No, he’s not neutered and she’s not spayed. I find the idea of getting my cat neutered to be very cruel and unkind. I can’t bring myself to do that, please help me out here. Also, I’d want to know if being loud is normal for cats on heat? His eating habits are fine. If i get him neutered, would it solve the problem of his screaming loud? Well, this is exactly what our little 4 month old Himalayan Persian is now doing. He is not neutered. He chases our 2 year old girl who is also not neutered. When she goes into heat, he jumps on her, he grabs her neck and her rump, he licks her, he watches her intently. He is doing all these things even though he can’t produce sperm yet. Natural instinctual response from the kitty toward the little girl. He is very playful. Plays peekaboo and jumps the big adult boys who have been neutered. When we took him to see is grandmother, he sat in the middle of her apartment and began to howl like a wolf. Then he went to the window and did hte same thing. I find it cruel and negligent to allow an intact cat to remain intact. NO reason to allow it unless cat has been cleared for ALL issues they could pass to offspring and is perfect in their exterior form. So basically allowing your cat to remain intact is because it would bother YOU to have neutering done. Just stating facts as people that work with animals know them. PLEASE become less ignorant and ALWAYS spay/neuter pets. No if ands or buts. Sorry but these ARE the facts and if more people would help there wouldn’t be SO many persians having problems. Fact. My dear Fubu is 13yrs.old now. Our cats depend on us! We need to do everything possible to keep them with us as long as we can! I have 8 stray cats outside I feed also, cats are so precious!!! Yes, agreed completely. Fubu is a good age. I lost my moggie black and white cat at the age of about 20. Still miss her. Thanks for visiting and sharing. It is heartbreaking to see cats with health problems. Persian cats are so beautiful and, as with any cat, we should do our absolute best to take care of them. Our cats have always lived into old age and there’s info on our page that says they can even be 30 years old! We have some articles on cat health and encourage every cat owner and cat lover to be an advocate for cats everywhere! Protect what you have and take care of the orphan cats you see on the streets. They are important to us! To our cats’ health!! Thanks for visiting and the comment. The shocking thing about the Persian is that it is one of the oldest, most popular and best established cat breeds, yet it is riddled with potential health problems. How sad is that? The other long established cat breed, the Siamese, is even worse. What have breeders been up to?